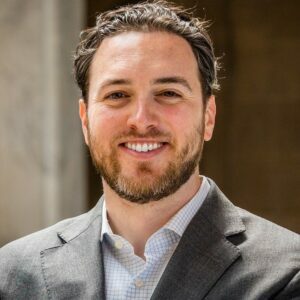 INDIANAPOLIS – Following bipartisan approval of initial program funding by the City-County Council last night, Mayor Joe Hogsett announced the appointment of Matt Impink as the executive director of the Indy Achieves initiative. In 2017, Mayor Hogsett brought together representatives from state and local government, institutions of higher education, workforce development and education nonprofits, as well as major corporate employers, to assemble recommendations aimed at improving access to post-secondary educational opportunities for all Marion County residents. Last month, Mayor Hogsett announced the recommendations of that group at Chapel Hill 7th and 8th Grade Center, and launched Indy Achieves. Indy Achieves, a comprehensive program to make post-secondary credentials and degrees available to every Indianapolis resident, will be housed within EmployIndy, Marion County’s workforce development agency, as a standalone organization with an expected staff of nearly a dozen once fully launched. It will be funded exclusively through an annual appropriation by the City-County Council that will not require any new taxes, as well as through agreements with both Ivy Tech and IUPUI who will financially participate in the program. As executive director, Matt will guide Indy Achieves’ mission to improve access and completion of high quality degrees and credentials for Marion County students. This will entail offering aid to students through existing scholarships, marshaling private and philanthropic resources to provide wraparound services for residents pursuing a post-secondary degree, as well as monitoring Indianapolis’ workforce needs to ensure the model remains effective. Prior to being appointed, Matt served as Director of Policy and Civic Engagement at the Indy Chamber where he led the Chamber’s efforts to expand mass transit, grow internship opportunities, and develop an inclusive growth agenda for economic development. Prior to that, Matt worked as a researcher at the IU Public Policy Institute, a community organizer at Stand for Children Indiana, and consultant at Lumina Foundation for Education. Matt began his career in public education as an 11th grade U.S. History teacher while serving in Teach for America. Matt graduated with a Bachelor of Arts from the University of Pennsylvania and a Master of Public Affairs degree from IU School of Public and Environmental Affairs at IUPUI. As a proud Indianapolis native, he serves on the board of directors for Southeast Neighborhood Development (SEND), Indiana INTERNnet, and Latino Youth Collective. For more information about Indy Achieves, visit IndyAchieves.org.